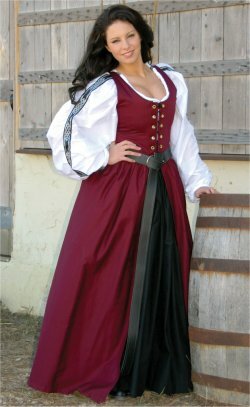 Our cotton Irish Renaissance Dress is perfect for the lass on hot days. The gown is boned in the front for a dramatic push-up shaping. The gown is fully reversible and the gown can be worn with the black side of the bodice out (the skirt will remain the same color). Wear our Irish Gown with your favorite chemise and a brightly colored Gathered Peasant Skirt (each sold separately).